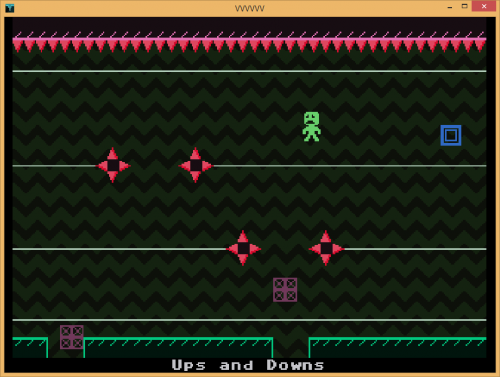 Not Easy Being Green tells the story of Verdigris after the events of VVVVVV. A new dimension has several people trapped because they have never learned or are too afraid to flip! Will Verdigris be able to save them all? This is a long player level (20x20 map) with internal scripting. 1. Game is now 99% stable! All sections have been tested except for part of a very hard secret section. Everything works as intended in these sections except for one cutscene which just doesn't show up for some unknown reason, and some weirdness with a scene in the secret section. 2. Toned down a lot of stupidly difficult rooms, such as those in the green ? section. 3. Fixed a few rooms that were impossible due to broken scripts, poor platform placement, etc. Everything in the normal part of the game is now possible. 4. Hellevator section is now possible! Moderately hard but loads of fun. Unfortunately the special scene (which is supposed to trigger upon beating it) doesn't show up and the characters just stand there. 5. First part of the secret section has been confirmed as possible. This is HARD (I died 1767 times in testing this). Haven't tested after that point in the secret section yet though.